Our team will guide you through all the practical and legislative considerations for your commercial lighting installations. Buildings pre-dating the 1960s may still have lighting installations that are out of date and not fit for purpose. Lighting circuits did not have Earthing until 1967. Earthing is necessary to prevent shocks and fire hazards, providing a path to automatically disconnect dangerous currents. Commercial lighting installations must comply with British Health and Safety Standards. 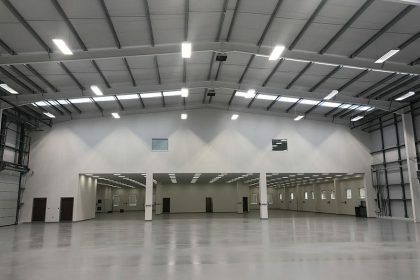 If you are looking to update your existing commercial lighting there are various options available to provide you with safety, security, in addition to saving you time and money. Firstly, and most importantly, security lighting can help to protect the individuals and the assets in your building. Our electricians support you with the design of your commerical lighting, strategically placing lights for cost efficiency as well as safety. Emergency lighting is independent of your main power supply. 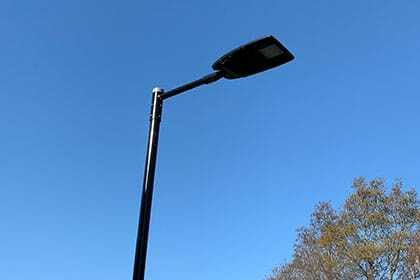 Its purpose is to automatically provide sufficient commercial lighting when all other power sources are not able to operate. For example, in the event of a fire or power cut. 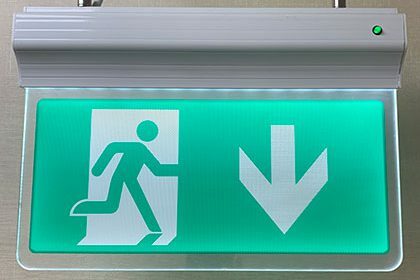 Most importantly, emergency lighting ensures the safety of you and your staff, highlighting the exit routes of your premises if/when danger arises. An LED upgrade is a great lighting solution to save time, money and energy for any commercial or industrial business. You can utilise Light Emitting Diodes (LEDs) anywhere in the inside or out and they come in various designs. With a choice of Panel Lights, Bay Lights or Tube Lights you can choose the best lighting for your industry. In addition to saving money and reducing your carbon footprint. Busbar trunking may be a convenient solution to your commercial lighting involving the use of copper or aluminum bars, rather than traditional cabling systems, to distribute electrical power. If you are refurbishing your premises, Busbar trucking may be the simple solution for saving you time and money now and in the future. Upgrade your existing systems to ensure that they comply with the British Standards BS EN 12464 and BS 5489:2013. This states that car park lighting must be safe, even and consistent. We design cost-efficient solutions based on the size, location, type of premises and the number of visitors.